The Times online has "Room for Debate" to mock some religions, including Mormonism: "I wouldn't buy the underwear just yet....[the Mormon Church] has used its mobilizing genius to pursue political goals, and individual Mormons have obeyed like sheep." Would the Times mock the rituals of devout Muslims or compare them to sheep? Mormon fear at the New York Times. The paper's online 'Room for Debate' section, which 'invites knowledgeable outside contributors to discuss news events and other timely issues' on Monday asked 'What Is It About Mormons?," inspired by the prospect of Mitt Romney winning the Republican nomination for president. The fact that the Senate has for the last five years been led by a Mormon, Democrat Harry Reid, has failed to trigger similar concerns at the Times. The Times also shows it feels free to shower at least some religions with derision and mockery. Heading into the Florida primary, Mitt Romney appears to be in the lead. The candidate, whose results so far have been mixed, continues to be stymied by suspicions about his religion. But why are so many Americans uncomfortable with Mormonism? A recent Pew survey found that Mormons are hard-working and civic-minded. Couldn't the nation use some Mormon discipline: frugality, morality, self-improvement, worldliness? Indeed, with these traits, shouldn't Americans be dying to vote for a Mormon? 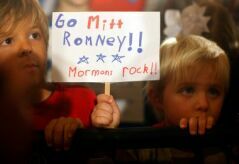 According to three of the Times five chosen outsiders, Americans have good reason to fear Mormons, while the other two writers lamented prejudice against Mormons, saying it would hurt a Romney presidential run. Can you imagine the Times printing an op-ed likening devout Muslims to sheep, or mocking their religious rituals? In contrast, the Times readily leaps to the defense of Muslims against what it considers anti-Muslim fear-mongering. As the MRC's Dan Gainor documented Tuesday, "The New York Times has written seven separate pieces - including an op-ed and an editorial - on the 'firestorm' over the movie 'The Third Jihad.' The editorial, headlined 'Hate Film,' criticized the New York Police Department's 'decision to show a hate-filled film about Muslims to more than 1,400 city police officers.'"